The Jolley's Journey: Mattherella Found His Calling In Life!!!!!! Mattherella Found His Calling In Life!!!!!! For a mere 50 dollars Matherella accepted the dangerous job to be a lure for a Sasquach expedition held by National Geographic, which lead him to find his calling in Life..... the Most Effective Sasquach Lure Known To Man!!! 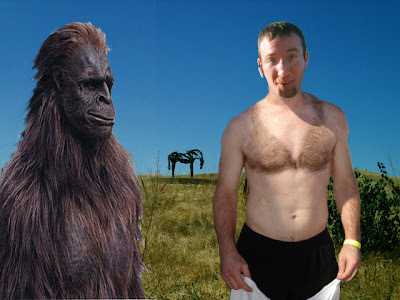 When asked how he thought of such a unique way to attract Big Foot..... he said nothing more than"I HAVE ALWAYS KNOWN THAT I WAS A JUNGLE BEAST...GRRRRR"